Plate ninety from the fourth volume of James Forbes' "Oriental Memoirs". In January 1784, Forbes(1749-1819)set sail for England halting briefly at Goa, Tellicherry and St. Helena. He was forced to stay at Tellicherry for a fortnight while the ship completed the cargo of pepper. 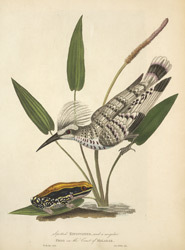 During his stay his friends procured for him 'every possible variety in the natural history of this part of Malabar; among others a beautiful frog, richly shaded and spotted with blue, yellow, ornage, white and black...'. The Spotted Kingfisher, 'frequently varies its plumage; the black marks being sometimes less regular and more predominant; but it always forms a pleasing contrast to the brilliant azure, green and golden plumage of the other birds of this species'.